Charlaine Harris! That’s what I said. Charlaine Harris! She’s the mother of the Sookie Stackhouse books, which spawned the True Blood series, and is an ordinary, kind of plain, Southern, middle aged woman. I love that. She spoke at one of the author breakfasts at BEA and she was funny, kind of self-deprecating, and just plain old nice. I’m giving away Dead Reckoning, her newest story set in Bon Temps, Louisiana. I was in Louisiana once. It was probably about 1989 or ’90 and I stayed in the French Quarter of New Orleans with the man who would one day become my husband. 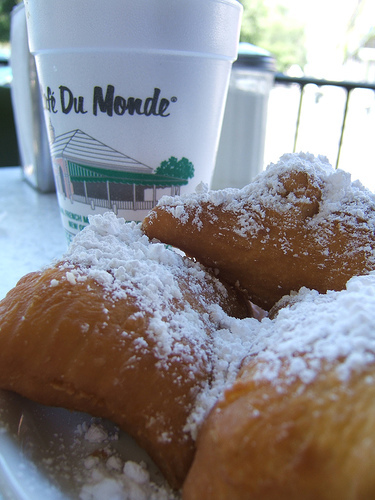 We ate beignettes and drank coffee with chicory in it at Cafe du Monde. I was probably in the midst of reading an Anne Rice book, perhaps Vampire Lestat or Queen of the Damned. That’s over 20 years ago now, vamps have come out of the coffin, and the genre is still strong as ever. I love writers like Charlaine Harris. While I was devouring Anne Rice’s books and drinking coffee, Charlaine was starting to publish mysteries. She kept plugging away at her writing through the Aurora Teagarden series and then the Shakespeare series, until BOOM! She hit the nail on the coffin and created the Sookieverse, filled with vampires, shape shifters, werewolves, fairies and all sorts of other folk. Are you a genre fiction reader? Do you find yourself reading books with the same theme, over and over again? How do you pick the next thing you are going to read?